Grace In Our Moments: How To Control Your Emotions - Review and Giveaway! How To Control Your Emotions - Review and Giveaway! I'm no stranger to roller coaster emotions. Life is full of ups and downs, and my emotions have a way of changing as fast as the twists and turns. I can pinpoint big events that made my emotions go crazy: seven moves in my first seven years of marriage; a big pregnancy scare and the premature birth of our second child; going back to school at 30 to finish my degree and launch a new career; and my parents marriage almost crumbling just as I returned to college. Sometimes, though, it 's not the big things that put my emotions in overdrive - it's the little everyday stresses. I'm guessing it's the same for you. It's when you're running late for work, or the kids won't stop fighting, or you can't stretch your budget any more. Emotions can overwhelm you when you can't make the number on the scale change, or you don't like the reflection staring back at you from the mirror. You may feel defenseless against your emotions - but you don't have to be. I've been a fan of Brooke McGlothlin for several years, since the first time I read Warrior Prayers. 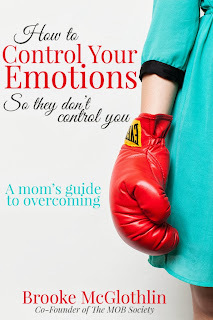 I was so excited to have the chance to review her newest book, How To Control Your Emotions So They Don't Control You. If you've ever struggled with your emotions, you need this book. Brooke outlines simple strategies to help you bring your emotions under control, along with Scriptures to help fight off the lies of the enemy. She also shares examples of her own struggles - and sometimes, all a mom needs to know is that she's not alone in her fight! Best of all, you can WIN a free copy of it this week! Just leave a comment below to enter. The winner we be announces Sunday, October 6th. It sounds like I could really use this book, my emotions get the best of me a lot! !